Eva Longoria has come a long way since her The Young and the Restless and Desperate Housewives days. Earlier this month Longoria received her master's degree in Chicano studies from Cal State Northridge but before she became the hot sensation that we know today she worked at a Wendy's restaurant. Yup, she flipped burgers and served French fries for three years while in high school. Now, Longoria co-owns a Hollywood restaurant called Beso with celebrity Chef Todd English. 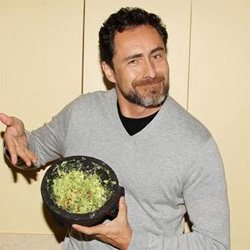 Mexican actor Demian Bichir stormed through Hollywood two years ago when he received a Best Actor Oscar nomination for A Better Life. Prior to making his big American crossover, Bichir was a well-respected actor in Mexico. He moved to New York at age 22 and began taking English lessons with hopes of landing any small role. In the meantime, he got a job as a busboy at Rosa Mexicano restaurant and learned how to make tasty side-table guacamole. Here's what Bichir told us last year about his cooking skills. Cuban-American actress Eva Mendes grew up in Glendale, California. She attended Hoover High School and later gave college a try for one semester before quitting to pursue an acting career. So what did Mendes do for some extra cash? Well, in 1995 she worked at the Glendale Galleria mall and sold delectable delights at Hot Dog on a Stick. Her hot dog days were short-lived a year later when she appeared in Will Smith's music video "Miami". Before Adam Rodriguez steamed up the big screen with his entertaining dance moves in Magic Mike, he worked as a stockbroker. Rodriguez actually wanted to be a professional baseball player but after a high school injury he turned to acting. He first appeared in a few commercials and TV shows but his big break came in 2002 when joined the cast of CSI: Miami. Read our exclusive interview. We all know that Jenny from the block used to be a Fly Girl in the hit TV series In Living Color, but while Jennifer Lopez struggled to make it as a dancer she worked at a law firm during the day. Turns out La Lopez is a pro at filing paperwork. Spanish actor Javier Bardem has probably worked the most odd jobs, which only shows his wide range of talents. Before making it big Bardem worked as a bouncer, writer, construction worker and a stripper! Why didn’t he get cast in Magic Mike? Apparently his stripping job was a one night thing only. ¡Que lástima! Danny Trejo is known as a badass on-screen and offscreen. For years he's been called "The Mayor" around Venice Beach, California for being the go-to mediator between cops and gang members. 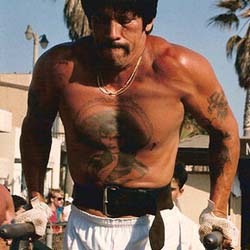 Prior to making it big in Hollywood, Trejo was considering a career in boxing but that all changed when he had to serve an 11-year sentence for drug and robbery charges. Upon his release he served as an extra in the film Runaway Train where Trejo reconnected with a former inmate, Edward Bunker, who just so happened to be the film’s screenwriter. Bunker offered Trejo a job as a boxing trainer for star Eric Roberts. The film's director liked Trejo's work so much that he offered him a more prominent role in the film. Check out our exclusive interview with El Alcalde.